Book Review: Love, Life and Elephants: An African Love Story – BOBBY JAMES. Set before “Dame Daphne’s” described African backdrop, Love, Life and Elephants: An African Love Story is a breathtaking portrayal of a fulfilled life not without its challenges. The reader learns of her wild upbringing, her adolescence and of love found and intermittently lost throughout adulthood. Sheldrick’s descriptions of Africa’s vast, yet unforgiving beauty – and her interactions with elephants, lend themselves perfectly to a longing for her life. Yet, I can only imagine the world she’s navigated and the courage and strength it’s taken. The thought of surviving an untamed landscape filled with violence from natural and manmade (poaching, settler raids, political corruption) worlds is daunting. Add to that thoughts of growing and succeeding in a world without the amenities we often take for granted. It’s a great deal to imagine, and I dare say, one I’m almost happy to not have had to endure. Ironically, it’s also an experience I envy – and one I wish I could have had. The thoughts of seeing elephants in the wild – or being directly involved with their conservation is a dream of mine. 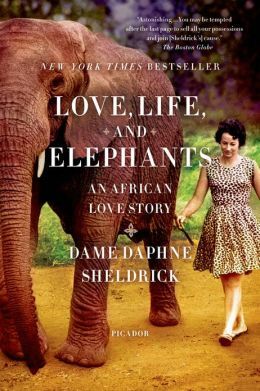 What I loved (and admired) most about Sheldrick’s memoir is that, despite coming from a situation of privilege, she and her husband David nurtured relationships (in both worlds) and worked hard to ensure a path through life – and either through family or the gracious support of others, the Sheldricks always found a way. As told by Dame Daphne, David made significant contributions to Africa and her wildlife. His career as a naturalist was essential to the establishment of wildlife refuges, the development of Tsvao (in Kenya), the publication of research and ultimately what’s become the David Sheldrick Wildlife Trust. Beside him, Dame Daphne made significant contributions of her own (ex. how to hand-rear a milk dependent elephant calf) and has spent her life tirelessly engaged in a battle for survival. Following David’s death, her commitment to his legacy, to elephants and to Africa is what makes this a remarkable story of love. Her story is immeasurably beautiful, shocking, heartbreaking and fulfilling. A story that lends itself to dramatic interpretations and vivid imagery. I hope someone options Dame Daphne’s memoir to create a beautiful and magical piece of cinema. Love, Life and Elephants will inspire you – infuriate you – and move you. I simply wish I had more time to discover and learn about [in detail] the other orphans and the next generation to inherit the Sheldrick Wildlife Trust. It is my desire to become more active with DSWT – and in other efforts to protect elephants on a global scale. Ironically, the inspiration I’ve drawn from her story is tempered by my longing to have a similarly great adventure and romance – complete with elephants. Bravo Dame Daphne, bravo! Note: In the epilogue, Sheldrick mentions having over 1,000 pages in her manuscript – and that her editor helped to condense the story into a “manageable” read. Sadly, I’d have loved to read the full story. There were so many parts I desired more from – and I wonder if it’s at all possible to “manageably” tell a life story. VIEW the preview for Gardeners of Eden, premiering on PIVOT, May 6, 2015 at 9/8c.